Etihad Airways is all set to take the aviation industry by storm when the dream project “The Residence”, a premium cabin with exclusive amenities and facilities, will be launched. Indian Eagle shares an insight into the new aircraft, infrastructure, cabins, interior decor, and flight plans of Etihad Airways. The First and Business Class flyers will have a boutique hotel stay experience on flights with Etihad Airways soon. As per the latest plan to make air travel more exclusive and cozy for the First Class travelers, Etihad Airways’ A380s will have a three-room cabin, “The Residence”, comprising a living room, a double bedroom and an en-suite shower room on the front of the upper deck of the aircraft. The Residence cabin can be booked for single or double occupancy. Free butler service will make it a double bonanza. Nine First Class Apartments including private suites will occupy the rest of the space on the upper deck of A380s in the fleet of Etihad Airways. The apartments will be furnished with reclining lounge seats and full-length beds. Each of the apartments will be accessorized with a mini bar and a wardrobe. There will be a common lounge and bar area for the First and Business Class flyers, too. Etihad Airways has infrastructural plans to upgrade the Economy Class on the agenda too. The A380s have been upgraded with Business Studio and Economy Smart Seat. The Business Studio seats are more spacious by 20%, and headrest space has been added to the Economy Class seats. Provision of 11-in monitor screens with the seats is an added advantage of flying in the Economy Class of Etihad Airways. A plan to upgrade the inflight entertainment system is on the agenda too. 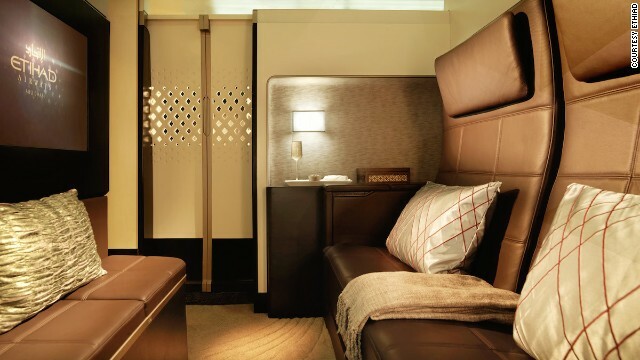 Etihad Airways will do up the interior décor of premium cabins to enliven the space for flyers. The interior will be refurbished with Arabic screens and blinds covering all equipment. Exclusive artifacts will add zing to the look and feel of the interior. Wood-finish doors of superlative quality will be fitted to the cabins. Moreover, special space with curtains for prayers will be there too. The premium flyers will have an enhanced dining experience. Click here to watch the video of The Residence”. Etihad Airways will operate the first A380 from London to Abu Dhabi in December 2014, at the first phase. The same route will see another A380 in the first quarter of 2015. Etihad may fly an A380 to Sydney and New York as well. Washington DC, Dusseldorf and Mumbai are the destinations of Etihad’s first Dreamliner. A380s and B787s in the fleet of Etihad Airways will be remodeled to deliver a more thrilling flight experience to premium flyers in the global aviation industry. “The flight cannot be matched in style and quality. We want our customers to experience flying in the new aircraft as a stay in a world-class hotel,” says James Hogan, President and CEO of Etihad Airways. Etihad Airways is one of the major international airlines that Indian Eagle books the cheapest flights with. IndianEagle.com offers air tickets from Etihad Airways at the best prices.